Gerald Anderson on love life: \"Hindi ko pa hinahanap.\"
Gerald Anderson on love life: "Hindi ko pa hinahanap." ABS-CBN actor Gerald Anderson puts up his own foundation, which he launched on his birthday last March 7. Beside him was his brother Kenneth. This March, Gerald Anderson made his 27th birthday memorable when he launched his own foundation, the Gerald Anderson Foundation (GAF) Inc., a non-profit volunteer organization committed to doing rescue operations with specialized canines and highly-trained personnel during calamities. 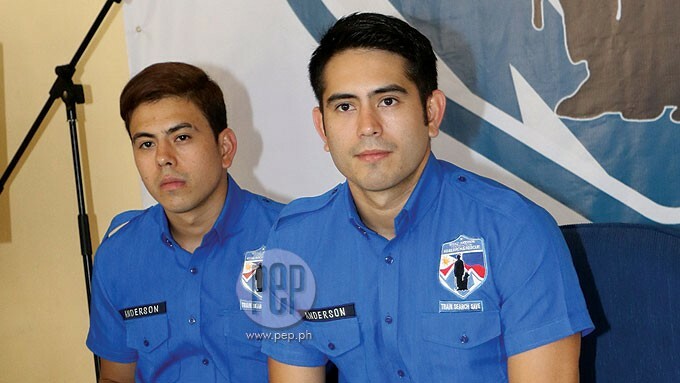 Gerald and younger brother Kenneth appeared before the members of the press in Le Reve Events Venue, Quezon City on March 7, on the day of Gerald’s actual birthday, to talk about his foundation. “Lagi pong may nangyayaring calamities sa bansa natin, di ba, lagi po nating napapanood yung mga balita kung ilan ang namatay, ilan ang sugatan o ilan ang na-displace, so ako, personally, I just wanna do my part in any way I can. “And ito ang pinakamagandang paraan na naisip ko para makatulong." Gerald added that this is his way of giving back for the many blessings he has so far received this year. “Hindi talaga ako makapaniwala sa simula ng 2016, sobrang naging successful po yung movie [Always Be My Maybe], launch ng foundation ko. His foundation is open to collaborate with other similar groups. “Ang daming canine teams [pero] kaya ba nila iligtas lahat sa dami ng tao sa Pilipinas, dami ng tao sa Manila? Gerald said that his organization is open for volunteers. “Please check the website, puwede kayong tumawag, puwede kayong mag-donate, puwede kayong mag-volunteer. “Mahirap ang training, mahirap gawin ‘to pero walang kapalit ang saya,” he guaranteed. CAREER OVER LOVE LIFE. Meanwhile, Gerald is set to star in another movie. He said, “May isa pang movie ako gagawin, action movie, military movie. However, Gerald clarified that he is not complaining. While his career is overflowing with projects, his love life is zero. “Medyo hindi exciting,” he added. “Ano’ng word for wala? Zero. “Wala, mahirap talaga. Ang dami kong dyina-juggle sa ngayon but let’s see. "Hindi ko pa hinahanap,” he ended.